OIS has revamped our Website with an updated look that provides a friendly feel with more navigational ease. Visit our site on Monday, April 16, 2018 to see new look! https://ois.atu.edu/. We are simultaneously launching a new Support Portal called Freshservice due to upcoming end of life for our old portal, Parature. You can expect the same dedicated, professional, knowledgeable, helpful, and respectful service that all OIS teams currently provide. You can reach our new Support Portal by clicking “Online Support” or “Submit a Ticket” from our new website. There you will find technical announcements, browse for solutions to known issues, submit a ticket, or request a service from our growing service catalog. Behind the scenes features provided with Freshservice allows OIS teams to better coordinate, document, and implement user requests. This tool will be valuable us we always strive for good, better, best service in our ever-changing environment. We always pride ourselves in the quality of technical service we deliver to faculty, staff, and students on our campus. All of our teams maintain Service Excellence as a top priority. You submitted Service WOW’s for thirteen OIS employees spanning six of our seven OIS teams during the 2017-2018 academic school year. We thank you for noticing! Pictured here from left to right, front row: Charles Poynter, Jr. (Tier 1 Support), Kim Newman (IT Security), Joe Keating (Tier II Desktop Support), Tim Caldwell (Tier II Desktop Support). Second row: Keesha Kneeland (Tier 1 Support), Jason Salmans (Network Support), Lawrence Ford (Instructional Technology). Top row: David Blackburn (Administrative Systems), and Cody Parsons (Administrative Systems). Not pictured here are: Corey Heflin (Tier II Desktop Support), David Waterson, John Ruff, and Jonathan Collins (Instructional Technology). Network Services has deployed outdoor wireless to cover the green space in the area between the BazTech, Chambers Cafeteria, Dean, McEver, and the Ross Pendergraft Library. They broadcast the wireless networks “ATU-Wireless” for our students, faculty, and staff as well as “Tech-Guest” for visitors to campus that do not have accounts. This is our first deployment of green space wireless and we’re excited to hear any feedback and suggestions for which areas people would like to see covered next. Disable wireless on printers and hotspots – Wireless printers and hotspots, such as a cell phone or PC broadcasting wireless, are not allowed. If your printer has wireless functionality, check to make sure it is disabled. If your wireless connectivity is having an issue and you need to get work done immediately, consider utilizing a wired port in your room or a computer in the library. While we understand some students used a wireless hotspot to get their homework done while we had wireless issues, a hotspot improves your wireless situation but makes it worse for everyone around you. Get 5ghz capable devices – 2.4ghz is an older wireless standard now and is prone to interference that can drastically lower a user’s wireless experience. While we are doing whatever possible to make 2.4ghz connectivity better, there is a limit to what can be done to improve it. 5ghz is a newer standard, supports higher data rates, and is less likely to encounter interference. Most newer devices are dual-band which means they are capable of utilizing 2.4ghz or 5ghz, however, we have seen some of the cheaper laptop models at retailers still support only 2.4ghz. If your laptop or computer only supports 2.4ghz, consider buying a 5ghz capable wireless USB adapter. We have tested some inexpensive but highly recommended models that have shown good results. Report wireless issues – If users don’t report an issue, it can make it difficult for Network Services to identify the scale of a problem or if one even exists. Enterprise Services is working hard to improve the user experience for all virtual desktops. The server hardware that supports the virtual desktop infrastructure (VDI) is being upgraded after this semester. This upgrade includes new servers with SSD-based storage and graphics cards that will considerably improve the performance of all VDI virtual machines. The graphics enhancements make the user experience nearly indistinguishable from a using a physical computer and will provide greater capabilities for graphic-intensive applications. Enterprise Services is also working with Desktop Services to complete the transition from Windows 7 to Windows 10 on our lab computers with this upgrade. We are scheduled to complete this project before the summer term begins on June 4. 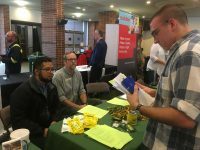 The Office of Information Systems participated in the ATU Part-Time, Summer, On-Campus, & Internship Job Fair in the Young Ballroom on March 28, 2018. Pictured here, seated from left to right, are Richard Velazques, Network Services Technician, and Alex Manly, Director of Technology Learning Resources. Applications and resumes from sixteen students were collected for the one open position on our Networked Systems team. Eight applicants were chosen and interviews are currently being conducted. Applications not selected will be kept on file for future openings on all OIS teams. The Office of Information Systems employs an average of 23 students. Silas Clark graduated from ATU in 2017 with a Bachelor of Science in Mathematics with a Concentration in Computer Science. He was a Teacher’s Assistant at ATU for Intermediate Algebra while studying as an undergrad. He worked briefly for the city of Russellville after graduation before being hired with our Administrative Systems team. Silas grew up in London and attended the Russellville School District. He now resides in Russellville. He enjoys playing guitar, putting together small puzzles and dioramas, and playing video games in his free time. Ryan Hancock joined the OIS as our Campus Support Technician on October 2, 2017. Ryan graduated from Arkansas Tech University in December 2016 with a Bachelor of Science Degree in Computer Science. He is currently studying for the Master of Science in Information Technology program. This is Ryan’s first post-graduation job. He lives in Russellville with his cat, Taco. John Ruff has been selected to fill the Assistant DBA position vacated by Robert Latus. John joined the OIS Administrative Systems team as a programmer in March 2016. Prior to working in OIS John served as a Graduate Assistant in Computer and Information Science. We look forward to working with John in his new role. Jason Collins, formerly served as a Network Services Engineer for OIS. He joined Arkansas Tech University in October 2016 and accepted a new position at UACCM in January. We wish Jason continued success in his new position. Robert Latus, former Assistant Database Administrator, left ATU to take a position with Arkansas Nuclear One in February this year. Robert was hired in January 2011 and served as a Programmer until taking on the role of Assistant DBA in July 2013 where he had served since that time. Robert was a valued member of our team and will be missed. We wish Robert the best in all that he does in life.